An apparatus called a Hoffman voltameter is being used for the electrolysis of water. It is connected to a direct current power source converter. In chemistry and manufacturing, electrolysis is a method of separating bonded elements and compounds by passing an electric current through them. The process is extremely useful for producing a variety of elements and compounds, including hydrogen, oxygen, chlorine, lithium, sodium, potassium, aluminum, sodium hydroxide, potassium chlorate, and aspirin. The electrolysis of water is used in submarines and space stations to generate oxygen for the crew. If hydrogen were to become an important fuel in the future, a major source would be the electrolysis of water. In general terms, the process of electrolysis can be described as follows. An ionic compound is dissolved in a solvent (which may be water or some other liquid) or melted by heating. As a result, ions from the compound become available in the liquid form, which is called the electrolyte. A pair of inert electrodes is immersed in the liquid, and an electrical voltage is applied to them. One electrode, called the cathode, becomes negatively charged; the other, called the anode, becomes positively charged. Each electrode attracts ions of opposite charge. Positively charged ions (cations) move toward the cathode, while negatively charged ions (anions) move toward the anode. The ions are carriers of electric current through the liquid (electrolyte). The cathode supplies electrons to the cations, and the anode takes up electrons from the anions. As a result, the cations and anions are neutralized at the electrodes, producing the desired elements or compounds. In most cases, some energy is released in the form of heat. In some cases, such as the high-temperature electrolysis of steam to produce hydrogen and oxygen, heat is absorbed from the surroundings. 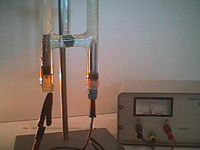 Electrolysis of an aqueous solution of table salt (sodium chloride or NaCl) produces aqueous sodium hydroxide and chlorine, usually in minute amounts. A solution of NaCl can be reliably electrolyzed to produce hydrogen. To produce chlorine commercially, molten sodium chloride is electrolyzed to produce sodium metal and chlorine gas. These products react violently with each other, so a mercury cell is used to keep them apart. One important use of electrolysis is to produce hydrogen gas from water. The reaction is as follows. The electrolysis of water can be performed by a simple, hands-on project. 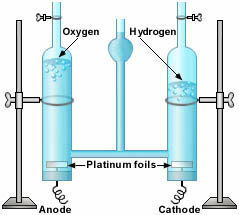 Platinum electrodes are dipped in a cup of salt water and connected to a battery or low-voltage DC power supply. (The salt is needed to produce ions that carry electricity.) When the power is switched on, hydrogen gas begins to bubble up at the cathode, and oxygen bubbles up at the anode. If the anode is not made of platinum, the oxygen usually reacts with the anode instead of being released as a gas. For example, if iron electrodes are placed in a solution of sodium chloride, iron oxide is produced at the anode, which reacts with water to form iron hydroxide. When this process is used to produce large quantities of hydrogen, it can significantly contaminate the electrolytic cell. For this reason, iron is not used for commercial electrolysis. The energy efficiency of water electrolysis varies widely. Some report an energy efficiency of 50–70 percent, while others report 80–94 percent. These values refer to the efficiency of converting electrical energy into hydrogen's chemical energy—the energy lost in generating the electricity is not included. The mass of a substance produced at an electrode during electrolysis is proportional to the number of moles of electrons (the quantity of electricity) transferred at that electrode. The amount (in "Faraday" units) of electric charge required to discharge one mole of substance at an electrode is equal to the number of "excess" elementary charges on that ion. These two statements are often considered Faraday's laws of electrolysis. Besides Faraday, scientific pioneers of electrolysis have included Sir Humphry Davy, Paul Héroult, Svante Arrhenius, and Adolph Wilhelm Hermann Kolbe. The process of electrolysis is used by industry to manufacture various materials, including aluminum, lithium, sodium, potassium, chlorine, sodium hydroxide, and sodium and potassium chlorate. The production of some organic compounds, such as aspirin and trifluoroacetic acid, also involves electrolysis. Likewise, this process can be used to produce hydrogen for use in hydrogen cars and fuel cells. In scientific laboratories, a technique called gel electrophoresis relies on electrolysis to separate molecules of different sizes. For instance, if a sample consists of a mixture of DNA strands of different lengths in an aqueous solution, the DNA (being negatively charged) can be made to pass through a porous gel under the influence of an electric field. All the DNA strands move toward the anode, but at different speeds—the shortest strands move fastest through the gel, while the longest strands move slowest. This process separates the strands of different sizes. Besides producing hydrogen, the electrolysis of water also produces oxygen. In nuclear submarines, seawater is electrolyzed to generate oxygen for the crew to be able to breathe while remaining under water for long periods of time. Likewise, space stations can use electrolysis to produce oxygen from wastewater or from surplus water made by fuel cells. Both these applications depend on an abundant electrical supply, which is provided by the nuclear reactor or solar panels. Some have suggested that the electrolysis of water be used to shift society toward producing and using hydrogen as a regular fuel for powering such things as electric motors and internal combustion engines. In this manner, they advocate moving toward a "hydrogen economy." This page was last modified on 8 November 2013, at 15:32.